WordPress typically has two major software releases per year and we are set for another major update this week. So, please take a moment to read about what’s new. We will be updating your websites by the end of the month. First of all, let me remind you the difference between a major release of WordPress and a minor update. Minor updates fix small issues and security bugs. Those updates are applied to your website immediately as soon as they are available. Major releases of WordPress add new features, improve existing elements and generally make everything better. While we could update your website immediately after highest larger releases, we give them a week or two. This allows theme and plugin developers to update their software as well. We also test the updates on our own test sites to make sure things are all shiny. So by about the end of the month we will be updating to WordPress 3.9 and you will begin to see these changes if you’re in the appropriate sections. 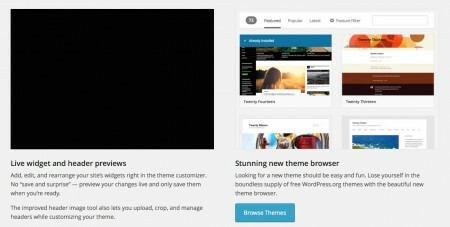 When changing or altering themes, WordPress now has a great Theme Customizer where you can see a live preview of the new/changed theme. The Theme Customizer now includes a Widget Customizer so you can see a live preview of what will happen as you change widgets. You can now add, edit, and customize widgets and see a live preview. This can be a great help when changing widgets and adding features in widgets. *Please use extreme caution when changing themes, because it can affect the look of your website and it may take some work to get things back to “normal”. The screens to Add a New Theme have also been updates to make things easier. You can use the “Add Media” button to add single images or galleries of images. “Add Media” could always add a single audio or video file. 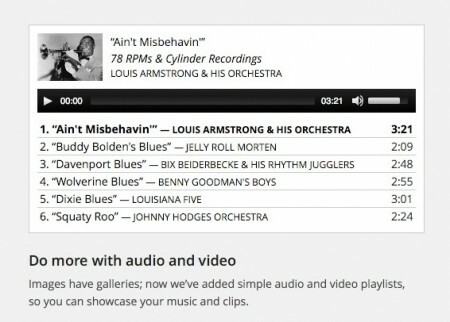 But now you can add a whole playlist with some basic styling. WordPress will even try to pull the metadata like cover art and ID3 tags into your website. The main editor in WordPress has undergone a major update. The goal here is to make editing and adding your content easier and simpler. One enhancement here is that you don’t even need to use the “Add Media” button. Drag an image or media file (or files) and they will be added automatically for you. That is just one less step and mouse click we have to make to add images, PDFs, Documents, Audio, and Video files. Another enhancement is that when you add a gallery of images, a live preview will be shown rather than a placeholder image. This makes it easier to see what you’re working on and feh how it will look on the your site prior to publishing. Speaking of images, before this latest version of WordPress, resizing images used to be a real pain and you never quite new if you got the image sized correctly. Now you can grab the corners of the image and resize just as you would in an application like Microsoft Word. You can even change out images very simply using the edit image button overlaid on inserted images. One final change in the editor of WordPress is that text copied and pasted from Microsoft Word will no longer contain strange characters and formatting. Those will be stripped out when text is pasted in to keep your website formatting consistent. What’s Changing at HawaiiWP.com LLC? 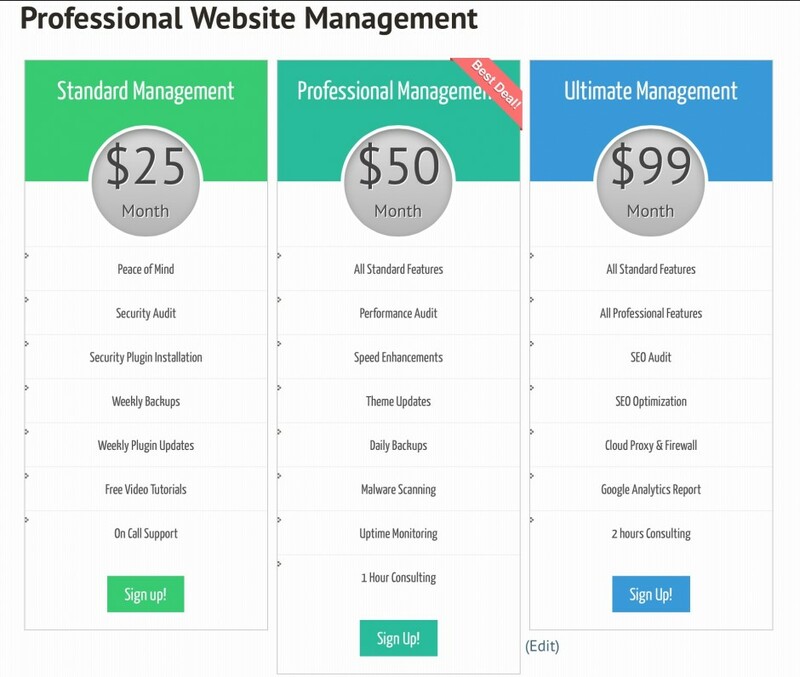 We have updated our monthly website Professional Management packages. In light of the recent Heartbleed Bug which is the greatest security issue in recent times (for more details, see this video made by our friend Justin Seeley) we have added a few more levels of security to our base maintenance package. If you are interested in getting upgraded security without changing maintenance packages, we can direct you to some recommended solutions. We did this because of the increasing need for security on our websites. Most people do not think of their website as a computer with complex software running 24/7 and exposed to attacks from the internet. When you think of a website in those terms, it’s easy to see why many people are caught unaware and their websites are hacked. Rest assured, even our base maintenance package has you covered by taking care of all of the basics of website security. If your website has been hacked before or you depend on your website for your business, we highly recommend moving to a higher package where we can include Malware Scanning, Cloud Firewalls, and other enhancements. The Professional and Ultimate Packages also entitle you 1-2 hours of our time. We can be your consultants in terms of online marketing, setting up “A-B Testing”, Copywriting assistance, Training with WordPress or a related system, or general tweaks and changes. As always, if you have questions, feel free to drop us an email or call us. You have seen the value of keeping us on your web team to assist you in maintaining your online business and we thank you for your continued support through the years.